After WWI the US underwent social and economic changes that re- shaped the country. This included ex- panded industrialization, commercialism, and consumerism. These factors all effected the paper stock in New York. Increased demand for paper came from the consumerism that was sweeping the country. This was driven by the prosperity experienced by post- war industrialization, mass production, new products, and advertising techniques that stimulated purchasing. Additionally, US economic policy reduced taxes on the wealthy and businesses which further encouraged growth, leading to an economic boom, and a rise in speculative investments. In line with these changes the paper stock men of New York made changes to the way they operated. 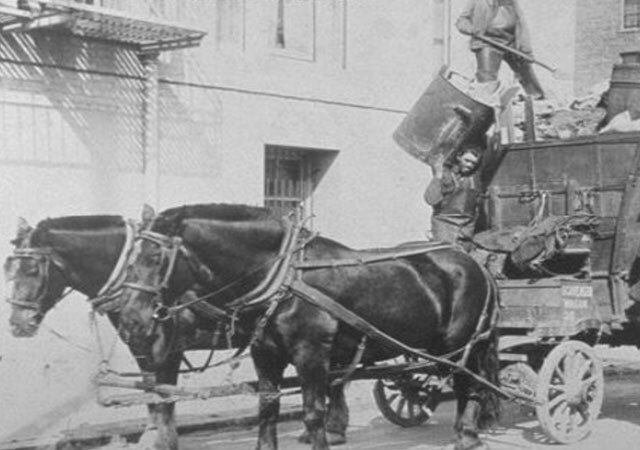 As America transitioned from horse drawn carriages to motor vehicles the adoption of trucks changed the paper stock enabling larger and heavier loads of paper being gathered. Other technology of the period provided for productivity improvements and more profits for the businessmen. Manual presses for bailing paper that were previously hand cranked became driven by electric motors creating larger and heavier waste paper that could be delivered to mills for use in making the new paper products that were in demand. The article, focusing on the waste paper generated in New York City, reports there were 788 businesses collecting tons of paper daily. One unnamed dealer is cited in it as an “average” business with 15 trucks and 30 employees collecting several hundred tons of waste paper daily. 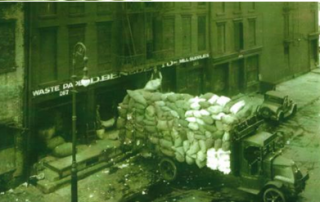 The largest quantities gathered were identified as 15-30 tons picked up weekly from Wall Street offices, two to three tons from one large hotel daily, and 20 tons daily from a newspaper publisher. Higher quality waste papers, which were worth more, came from printers quality grades was $2.50 per one hundred pounds then, equivalent to $34 today. To put those figures into perspective, the average pay for US laborers then was fifty cents an hour and in Milan, Italy it was ten cents an hour. The prosperity started a change in the structure of Little Italy with families beginning to leave the Downtown tenement buildings for better conditions. Many moved to the surrounding suburbs that were still close enough to Manhattan to commute to work. 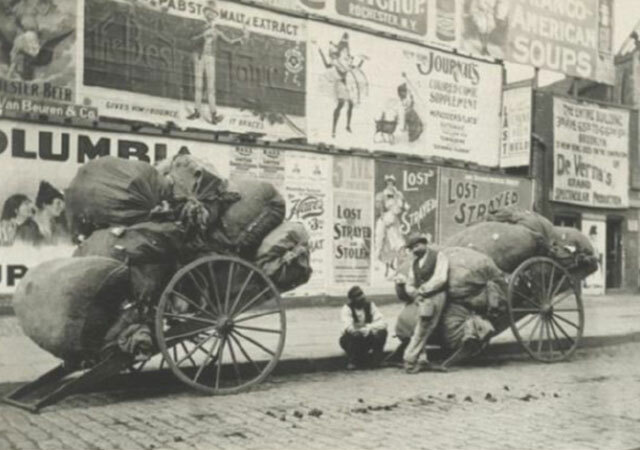 New Meets Old—This photograph from the post-WWI era shows the transition with horse carts in the back ground and a truck being loaded with large bails of paper heading for the mill to be made into new paper products. The scene is at the corner of Roosevelt and South Streets. 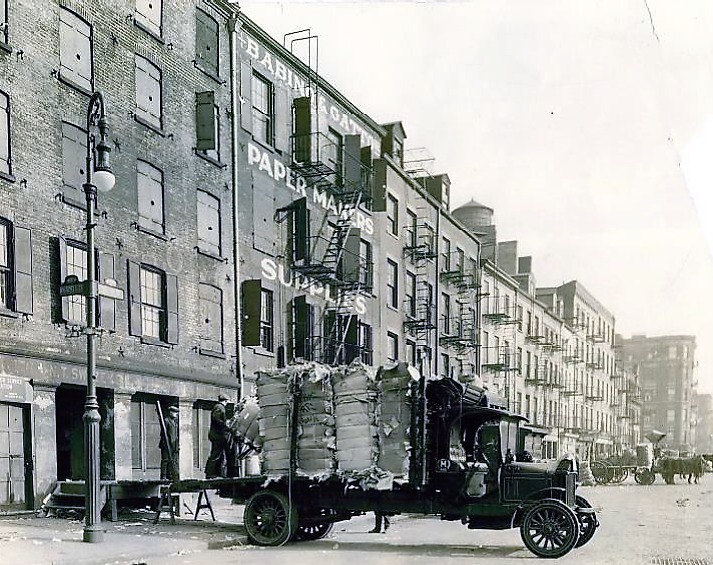 Ba- bino & Gatto Paper Makers Supplies, painted on the building behind the truck was located at 177 South Street and the truck being loaded was theirs. The horse carts further down the street also have paper stock materials, bags of waste paper and smaller bails of paper. Although mechanization was creeping into the business there was heavy dependence on manual labor and some special hand tools. The bail of paper shown being loaded was on a hand truck. These heavy hand trucks allowed the paper stock men to manually move bails weighing hundreds of pounds. The individual standing at the back is holding one of the other common tools of the paper stock men— the bailing hook. The Cracotan paper stock men of New York were early risers getting out and picking up the waste paper at their customers before the City became busy. Shown left is a half loaded truck at a stop where waste paper was picked up. 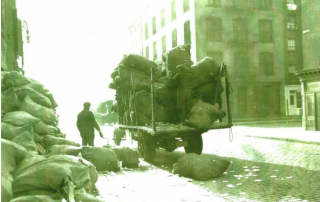 The burlap bags, filled with waste paper were usually piled up by the business in an area that was accessible to the paper stock men. Often there were scheduled days and time of pick-up. The loader on the street can clearly be seen holding his “hook” the ever present hand tool for paper stock men. Everyone also carried a pocket knife to help with the cutting open or tying the cord used to close the bags. The individual stacking the bags on the truck was probably the driver. This was a prized job, and required responsibility for the truck and also business contacts with customers, building superintendents, and other individuals the men came in contact with during their work. An important part of the driver’s job was to represent the business by maintaining good relationships with the people they interfaced with. This included making payments, tipping building staff that helped them, collecting bills, and opening new accounts. In smaller companies this may have been the owner, one of the partners or a family member. The truck, was typical of those preferred for paper stock work in that era , with an open body and moveable stakes that could accommodate different configurations depending on what was being loaded on the truck. While driving with a load, the rear would be covered by a tarpaulin to reduce littering. The culmination of all the efforts of sorting and packing the paper into bales was selling them to paper mills. This was handled through a broker and prices for the different grades of paper was based on the demand the mills had at any time for them to use in making products. The price for waste paper varied on market conditions and the grade of paper. Mixed papers, which was mostly office waste, was the lowest grade and brought a low price. Sometimes when the price dropped too low this paper was taken to dumps until demand and prices from the mills rose. The better grades of paper (for example, colored ledgers, white ledgers, corrugated) which brought higher process also changed over time based on the differing needs for papers that the mills needed to produce goods. An illustration is the demand for tabulator (punched) cards that were used to program mainframe computers in the mid-20th century. From not being a grade in the early part of the century, they were the most valuable waste paper by the 1960’s, as vast amounts were needed until computer programming changed in the late 1970’s; in fact, tab cards are now almost non-existent. This change, driven by technology, was always a factor in the paper stock business. 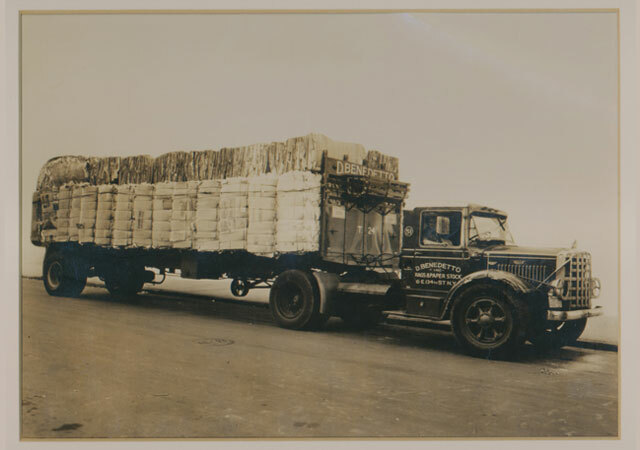 The photograph to the left shows a smaller pre-WWII truck which is loading mixed paper bales to go to a mill. At the mills, the used paper would be unloaded and dumped into large vats of acids that broke the paper down into pulp which was then formulated into a paper for another product. Since the price paid to the paper stock dealer was based on weight (usually a certain amount per hundred pounds), sometimes tricks were used to increase the weight of the bales. It was known for bales to be returned from the mills after they were discovered to contain more than paper. There are stories of bathtubs, kitchen sinks, and toilet bowls returning to a paper stock dealer inside a bale of paper. But, there were also other stories of mills asking for bales from certain dealers knowing they contained more than paper. Apparently, one dealer decided to get rid of the wire strapping he had by putting it in bales of corrugated cardboard. The mill never caught it until the mixing process was completed, but realized the added material actually helped the process by wrapping around the acid vat’s cutting blades improving their efficiency.